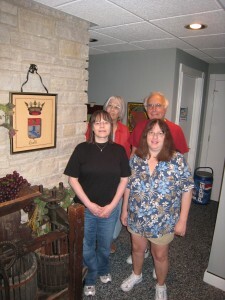 As I was saying in my previous blog, one of the highlights of my visit to Chicago in May was the day my sister Lori and I joined our cousins Allen Adezio and his wife Marie, and Vickie Di Nella for lunch at Allen & Marie’s beautiful home in southern Illinois. How are we connected? 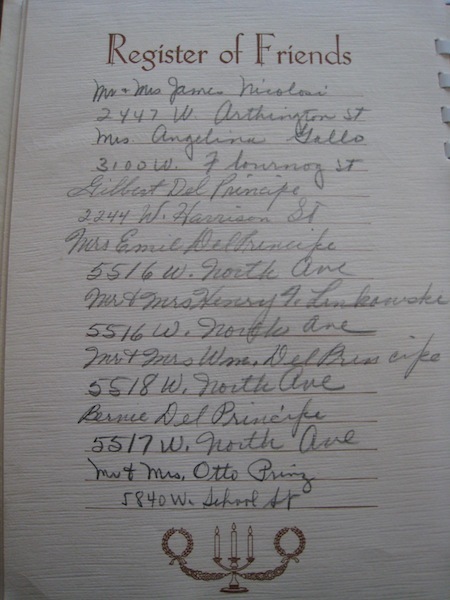 Elvira Ciolli is Lori and my great grandmother. Speranza (Mary) Ciolli is Allen’s great grandmother. Bibbiana Celestina is Vickie’s great grandmother. Elvira, Speranza, and Bibbiana were sisters. 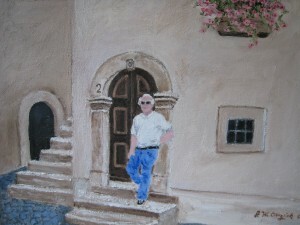 This stunning painting is hanging in the entry hallway of Allen & Marie’s home. 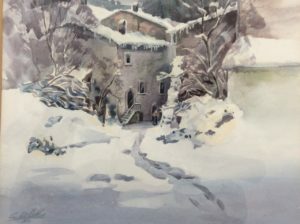 It was painted by a relative of Allen’s from a snap shot that was taken a few years ago when Allen and his brother Ron went to Italy with their wives. 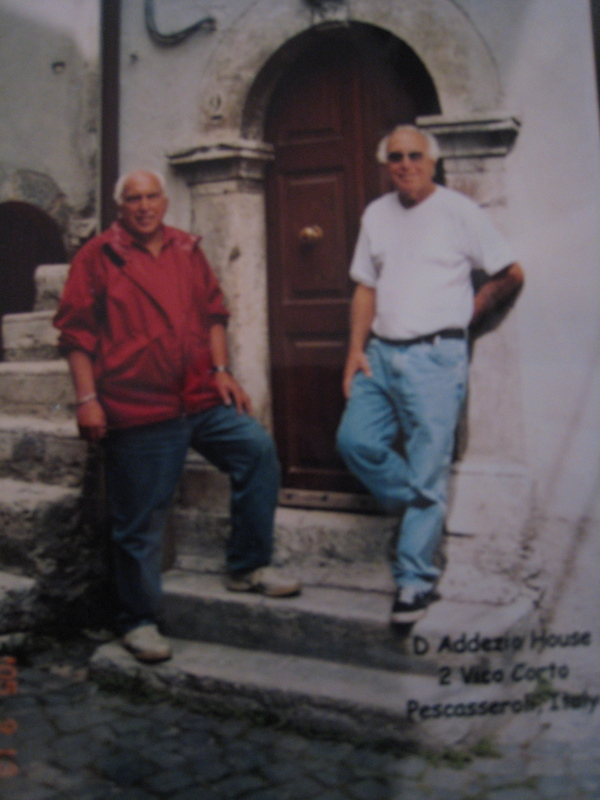 The photograph is Allen (on the right) and Ron in front of the Adezio family home in Italy. 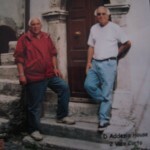 The writing on the photograph says D’Addezio House, 2 Vico Corto, Pescassoreli, Italy. This was the home of Allen and Ron’s father Cesidio (Jesse) Adezio, who was a Shepard as a little boy. 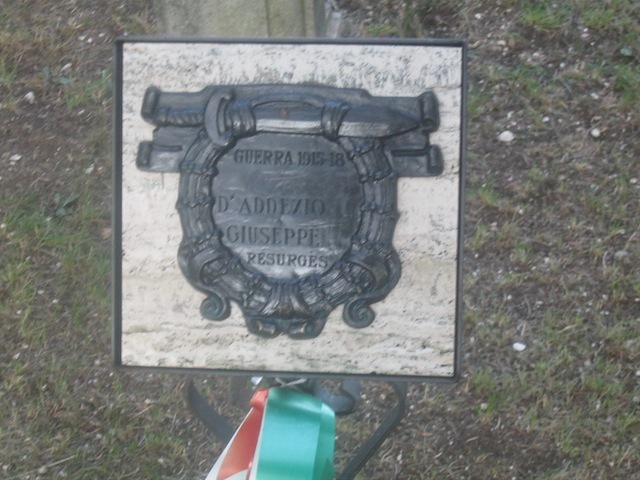 Cesidio’s parents were Luigi D’Addezio and Carmela Testa. Their children were Guiseppi (Joseph), Antonio (Babe), Cesidio (Jesse), Guilia, and Lucia. Allen’s last name is now Adezio so somewhere along the way the family name was changed. Unfortunately no family members currently live in the home. 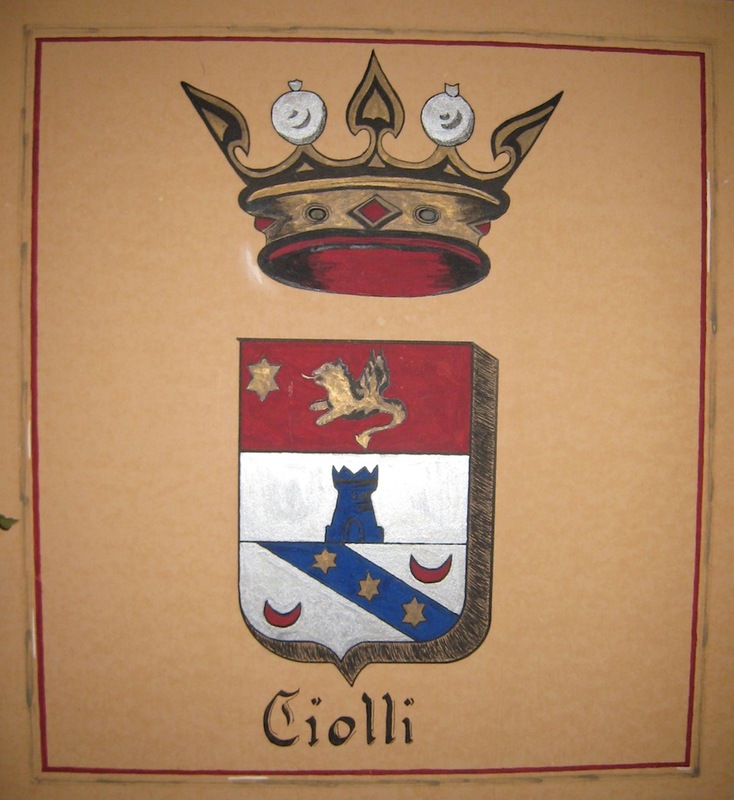 This is our Ciolli Family Crest. Some people refer to this as a Coat of Arms; they are basically the same thing. 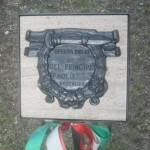 Allen’s cousin said that her father was given the “plans” for the Ciolli Crest from Frank DePirro. (Frank was married to Ann who was the daughter of Gemma Nicolina Ciolli and Giacomo Leone). Now let me introduce Barbara. Barbara found our family website and emailed me that she was one of my long lost relatives. I love it when that happens! 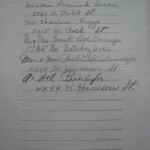 Barbara’s grandfather was Carmino (Charles) Ciolli, brother to my great grandmother Elvira. (Check back later for more info, because of course I will have to write a blog about Barbara’s family.) Allen’s wife Marie, Barbara, Joe and I sent several emails back and forth. It turns out that Barbara has the very same Crest hanging in her home. Barbara agreed to copy a black and white version of her Crest and mail it to Marie and I.
Barbara knows that her Crest was done and researched by a commercial company in Italy in the 1930’s. Her crest bears the stamp: Archivio Araldivo Cimino. We assume this is the company that made the Crest. Since this is the very same family Crest we thought it was time to take this investigation one step further. 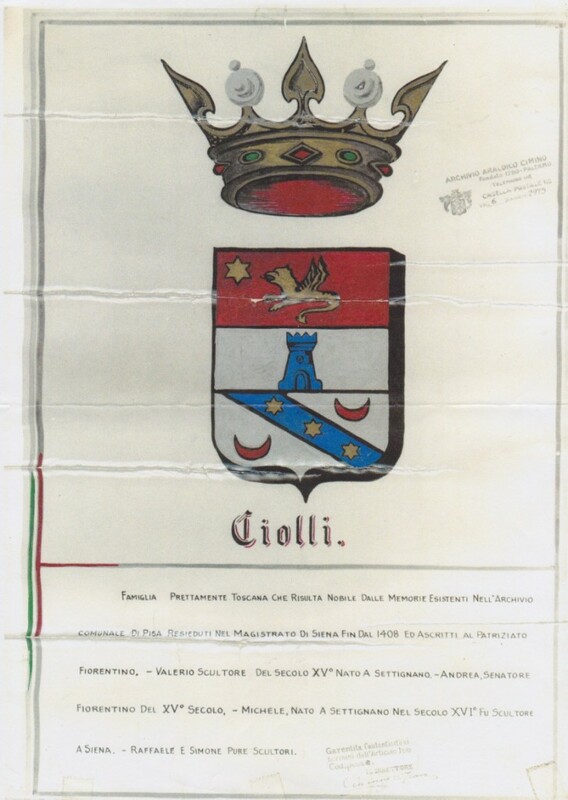 I turned once again to Kathy from GenTracer to ask her to research her archives and see if she could find any records of a family Crest for the Ciolli family. Oh and by the way – would she look for record of a Crest for the Del Principe family? I scanned the copy of the Crest that I received from Barbara to Kathy because there was some text below the Crest. Kathy didn’t find any record that an official Crest was made for the Ciolli family or the Del Principe family but she did give us an explanation of the text below the Ciolli Crest. Click on the Crest to see a larger version, click the back button to return to this blog. 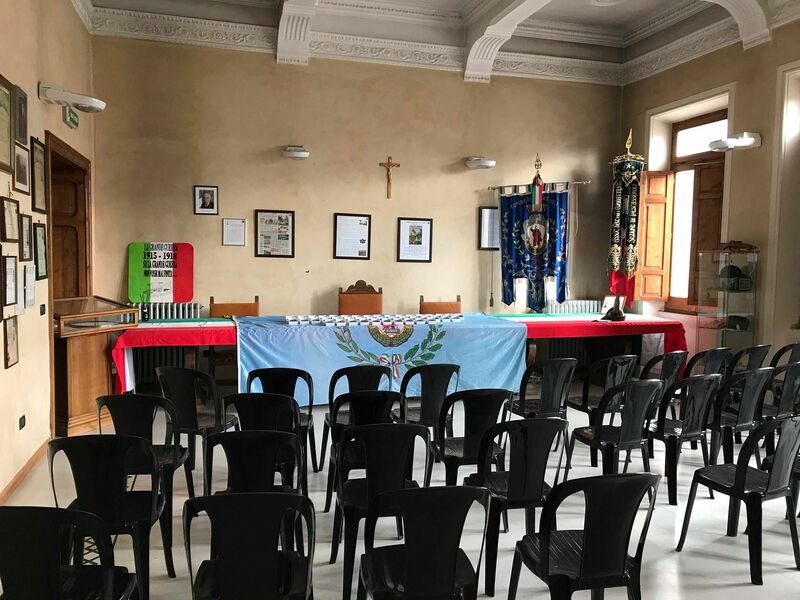 Kathy writes: The brief translation on the Crest is that the family is from Tuscany and Memorialized in the town archives of Pisa in the magistrate of Siena until 1408 and patrons in Florence. Valerio was a sculptor in the 15th century, born at Settignano. Andrea was a senator of Florence in the 15th century. Michele was born at Settignano in the 16th century and a scupturer in Siena. 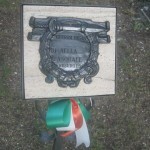 Raffaele and Simone were sculptors. Of course, there is no documentation of any of the above. There is also no clear connection to your family. 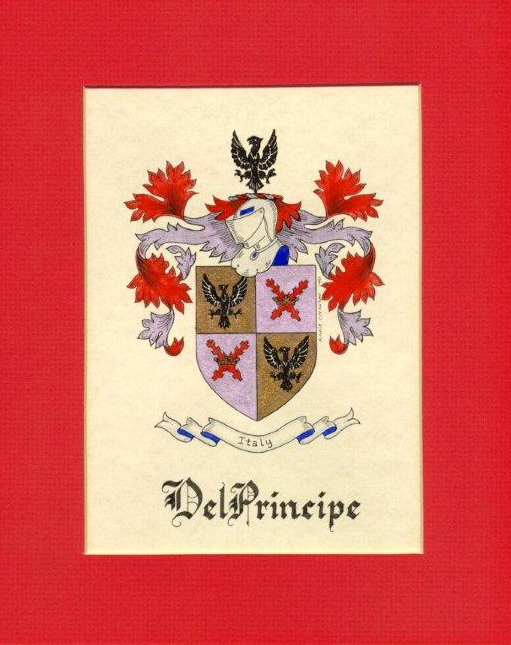 My brother shared this Del Principe Crest with me. It is an example of what our crest might look like. It is not authentic. If you have an interest in the origin of Family Crests and a Coat of Arms click on the links above and check out the websites that were sent to me from Kathy. Victoria Di Nella is my 3rd cousin, she lives in Illinois. In fact she now lives about 2 miles from the home where I was raised. She joined Lori and I for lunch at Allen & Marie’s home in May. 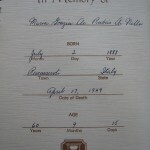 Her great grandmother is Bibbiana Celestina Ciolli born on Jan 19, 1865 in Pescasseroli, Italy. She was delivered by a mid wife named Gemma Di Nella. My great grandmother Elvira and Bibbiana Celestina were sisters. This photo was taken about 1914 – 1915. Bibbiano Celestina is seated. 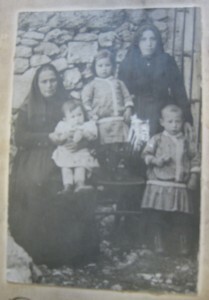 The baby on her lap is Vickie’s father Emilio (Emil) who was born in 1914. The woman standing is Maria Grazia De Rubeis Di Nella, her husband is Vito Di Nella. The boy standing is Vickie’s uncle Carmello (Carl), born in 1910. The little girl is Vickie’s aunt Anna Maria Antonia (Mary) Di Nella born in 1912. 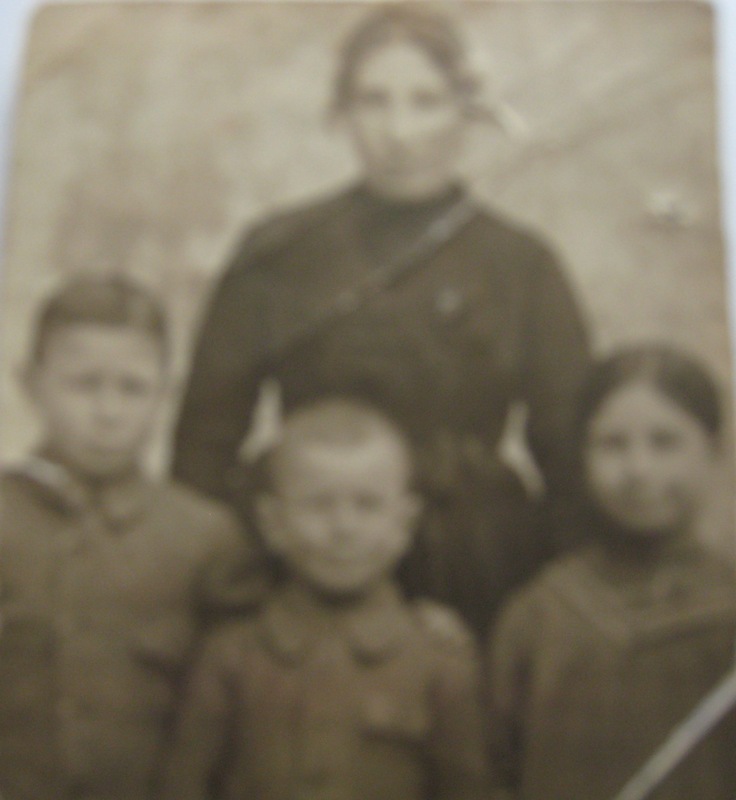 The photo below is the passport photo of Maria Grazia De Rubeis Di Nella (Vito’s wife) and their children; Emilio, Carmello, and Anna Maria Antonia. 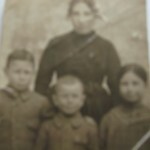 The same three children appear in both photos. Maria Grazia DeRubeis DiNella 1920. Bibbiana Celestina married Basilio Di Nella on Aug 18, 1883 and they had three sons; Vito, Pasquale, and Nicholas. 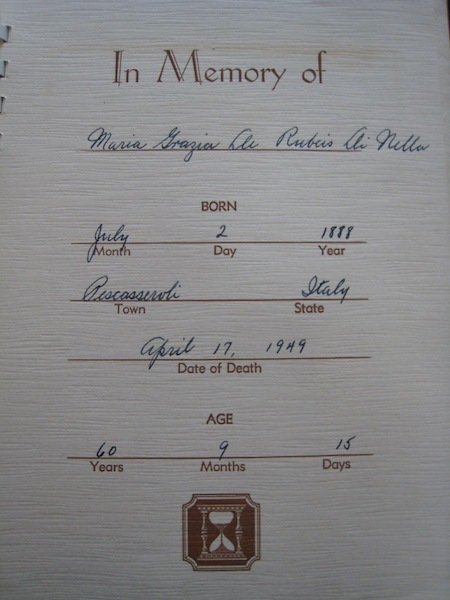 Vito (Vickie’s grandfather) was born in 1886, he married Maria Grace De Rubeis in 1910. They had ten children. Vito arrived in the USA on June 20, 1913 aboard the ship Italia. When he left Italy his wife was pregnant with Vickie’s father. His wife and three children came to the USA in 1920. 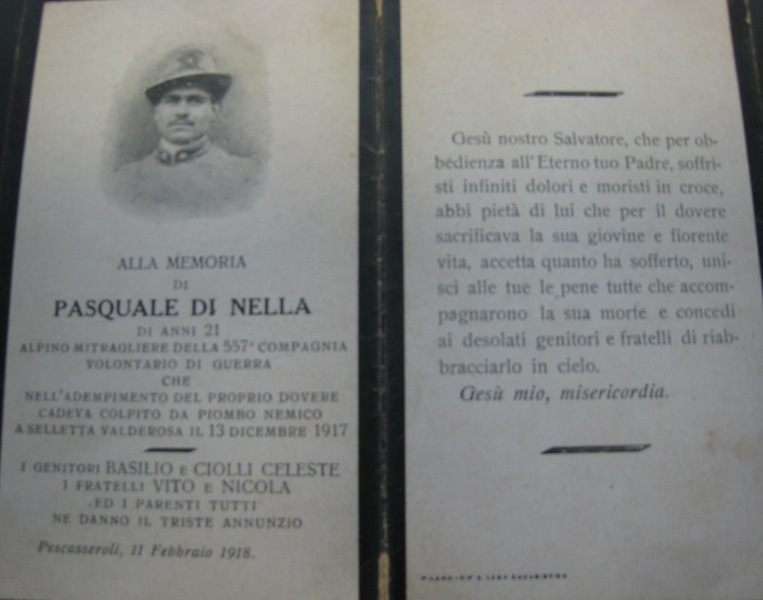 Pasquale came to Chicago but returned to Italy to serve in WWI. He was an Alpine soldier and was killed approx 1918. 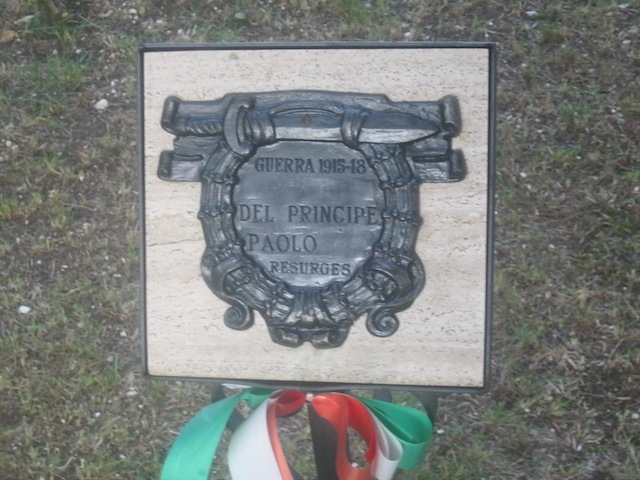 His name can be found on the statue in the town square in Pescasseroli. 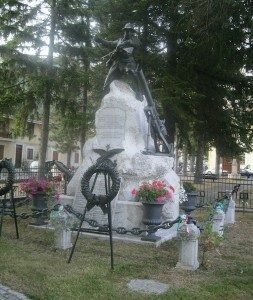 The Alpini are the elite mountain warfare soldiers of the Italian army. Formed in 1872 they are the oldest active mountain infantry in the world. 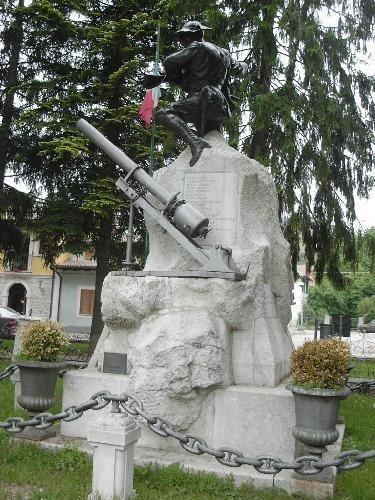 Their original mission was to protect Italy’s northern mountain border with France and Austria. 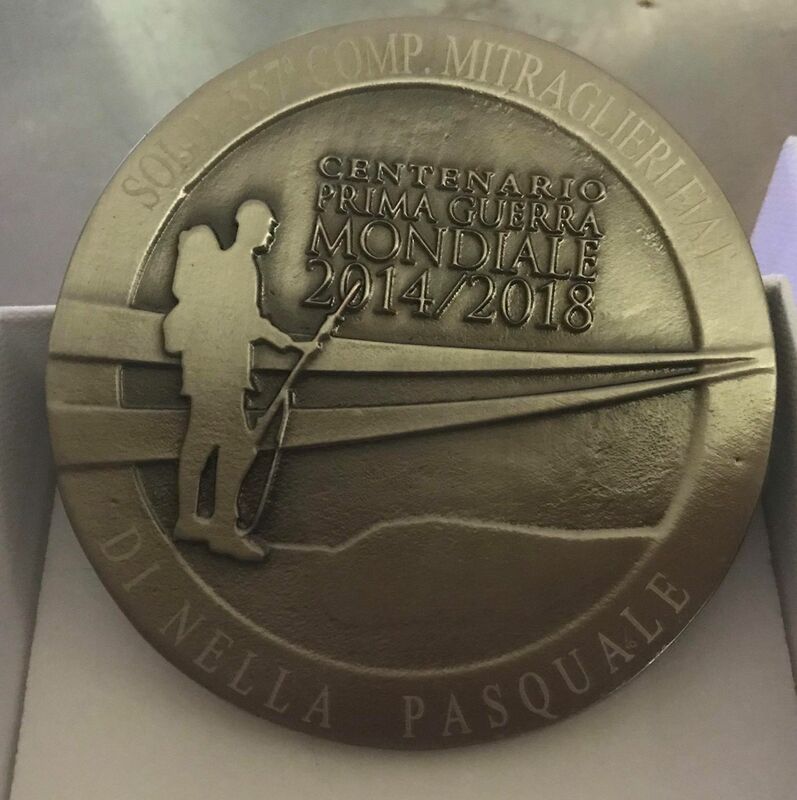 The soldiers were recruited from the local people who were used to the conditions and already had both good local knowledge as well as specialized skills for living and surviving in the mountains. 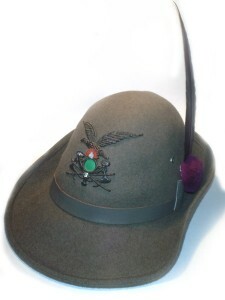 They also adopted the famous Cappello Alpino (Alpino hat) which included a white eagle feather for officers and a black raven feather for the men. They distinguished themselves during World War I when they fought a three year long campaign in the Alps against Austro-Hungarian and the German Alpenkorps in what has since become knows as the “War in snow and ice”. The Alpini saw heavy combat in the mountains and glaciers of the Alps suffering many casualties on both sides with over 12,000 Alpini casualties out of a total force of about 40,000. 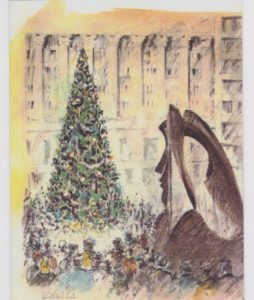 Click on the memorial below to read it, then click the back arrow to return to the blog. 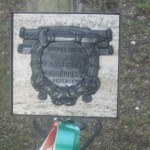 Nicholas lived in Pescasseroli his entire life. He had one child named Celestina. She married N. Siciliano and lives in Varessa, northeast of Florence. 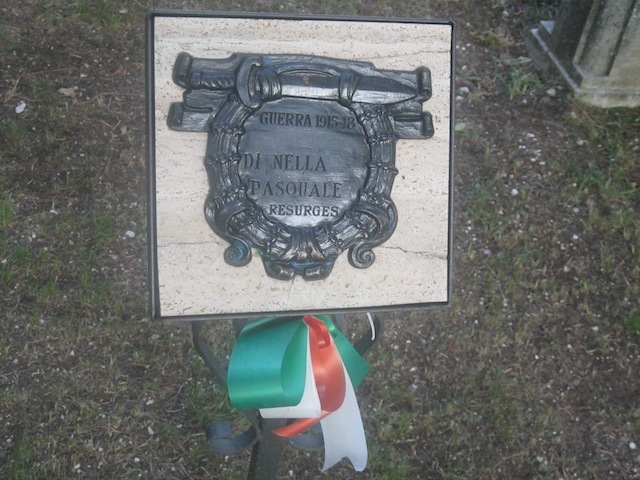 Vickie’s father was Emilio Alberto Di Nella and was born on Feb 13, 1914 in Pescasseroli, Italy. He married Helen Zak and they had three children; Gerald, Victoria, and Joanna. 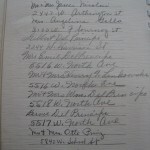 Vickie’s uncle Carmello (Carl) was in Pescasseroli Italy in February 1956. He was an artist and was working on a painting when a terrible snow storm crippled the town. Carl called his family in Chicago and asked for help for the town. 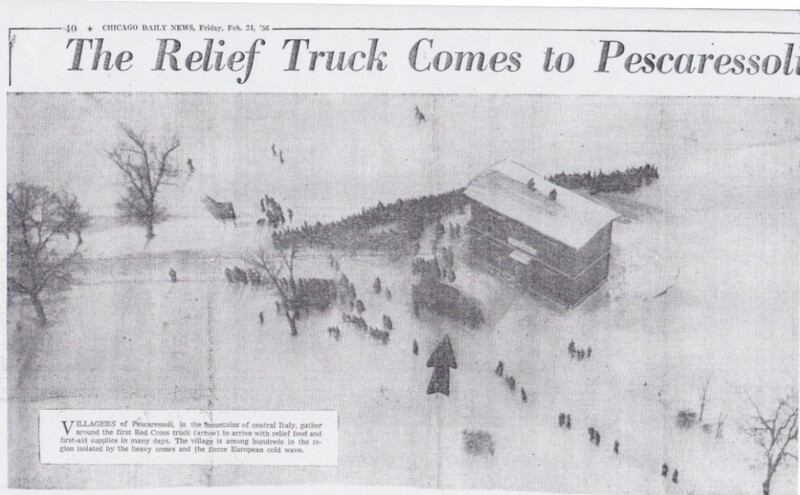 The photo above shows the relief truck that was sent to the village with the funds donated by Carl’s Chicago friends and relatives. 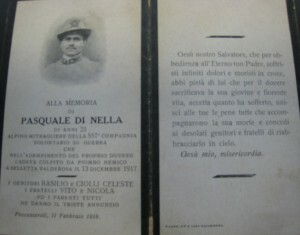 Below are three pages from a memorial book for Maria Grazia De Rubeis Di Nella. She died on Easter Sunday April 17, 1949. Click on the pages to enlarge them, then click on the back arrow to return to the blog. 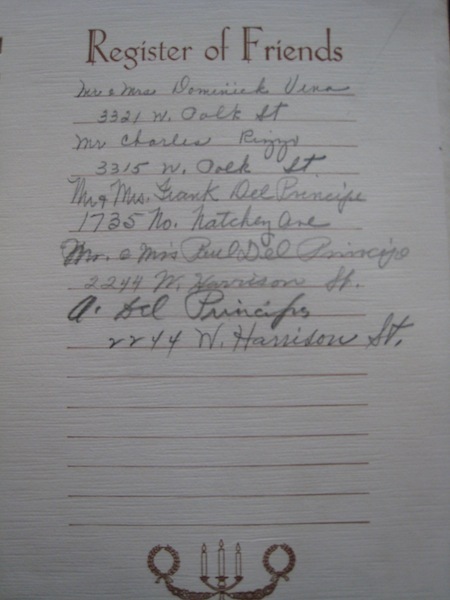 You may recongize many of the names, my grandfather Gilbert signed the guest book. 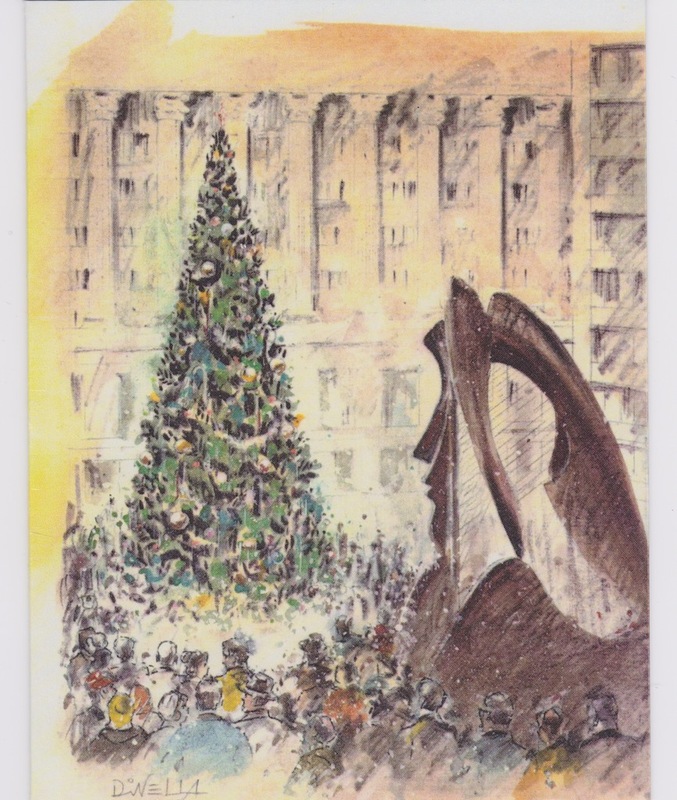 Thank you Vickie for all of the information and wonderful photographs that you’ve shared. It was a true pleasure to meet you. I look forward to much more correspondence between us as we continue to grow our family tree.